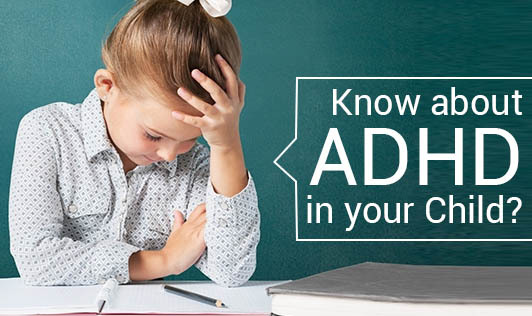 Know about ADHD in your Child? Children are precious to us. We make every effort to keep them happy and make them the best individuals. We feel bad if we don't recognize the problems in our child. Childhood hyperkinesis or Attention deficit hyperactivity disorder (ADHD) is a problem with inattentiveness, over-activity, impulsivity, or a combination. For these problems to be diagnosed as ADHD, they must be out of the normal range for a child's age and development. ADHD is the most commonly diagnosed behavioral disorder of childhood. It affects about 3 - 5% of school aged children. ADHD is diagnosed much more often in boys than in girls. Imaging studies suggest that the brains of children with ADHD are different from those of other children. Most children with ADHD also have at least one other developmental or behavioral problem. They may also have a psychiatric problem, such as depression or bipolar disorder. Set specific, appropriate target goals to guide therapy. Start medication and behavior therapy. Follow-up regularly with the doctor to check on goals, results, and any side effects of medications. During these check-ups, information should be gathered from parents, teachers and the child. Treat your child with love and care; he/she can be another Albert Einstein!